Vision blinds are quickly becoming a very popular choice in window fashion. A stylish adaptation of the traditional roller blind, they incorporate an innovative double layered translucent and opaque striped fabric, bringing enhanced privacy, shade and full closure all in one blind. Our range of electric Vision blinds is produced using the renowned Louvolite system. Visually attractive using beautiful British made fabrics and built to exacting standards for longevity, these blinds are easy to control at the touch of a switch, a remote button or via an app. Whether you are looking for maximum privacy, a stylish décor, easy controls, or all three, our vision roller blinds are made to order to create the perfect bespoke solution for the modern home. At Aquarius Blinds, there’s no such thing as a job that’s too big or too small. Whatever the size of your windows, we will endeavour to find a tailor made window blind solution that’s perfect for your design preferences and light adjustment needs. We can produce Vision blinds in widths that range from 340mm up to 2400mm, and in drops up to 240mm. All our electric roller blinds are all made to order, giving you complete control over the design and control features. We supply motorised Vision roller blinds in tube sizes of 40mm. Whatever colour, texture or pattern you may be looking for, we believe we have the largest choice of fabrics available locally. From serene, low key window treatments to vibrant feature blinds and everything in between, we’re sure to have a solution that’s just right for you. And if there’s a particular fabric you are looking for – just ask as and we will do our best to accommodate your request. Finishing touches make all the difference to the end result. At Aquarius Blinds, we want every bit of your blind system to look and fit perfectly. We are pleased to offer the hardware (brackets, fitting and fascias) for our Vision blinds in 6 standard colours, in addition to the option of special colour matching to your chosen fabric design. Why not create a window treatment that stands out from the crowd? Aiming to create a personal solution for the style of your home, the finishing touches matter to us as much as the roller blind itself. With our range of control movements, you are in full control of your motorised roller blinds. Touch a switch, a remote button or a mobile app to adjust light, shade or privacy levels to suit your exact preference at any time of day or night. The sophisticated Somfy® RTS system means you can operate your Vision roller blinds on a timer and from remote controls, whether or not you are at home. Simply plug in the RTS receiver and the power is all yours. Electrical power and control options comprise solar, battery and mains operated controls. As an experienced manufacturer of electrically operated blinds, Aquarius Blinds can advise on the most appropriate specification of motor to use with your chosen sized of blinds. We will guide you through the process and match the motor and control options to work with your window blind design and your specific requirements. Contact our friendly, professional team for information and advice regarding all your window covering needs. With our own high quality British based manufacturing plant and over 30 years’ experience of supplying and fitting luxury blinds, we’re confident that you won’t find better. Why not let us transform your home with a window treatment that ticks all the right boxes? 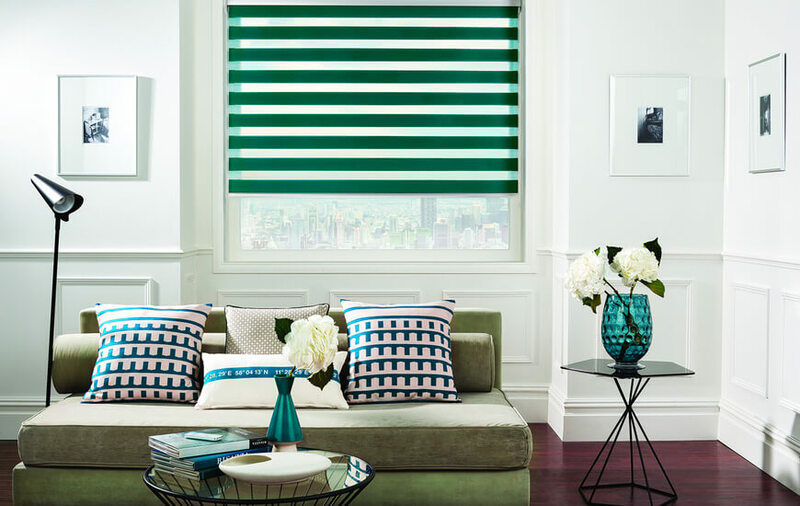 Get in touch today on 0800 953 0199, at info@aqblinds.co.uk, or visit our South London showroom to see how we can help. With Aquarius Blinds, installing electric Vision blinds couldn’t be simpler.